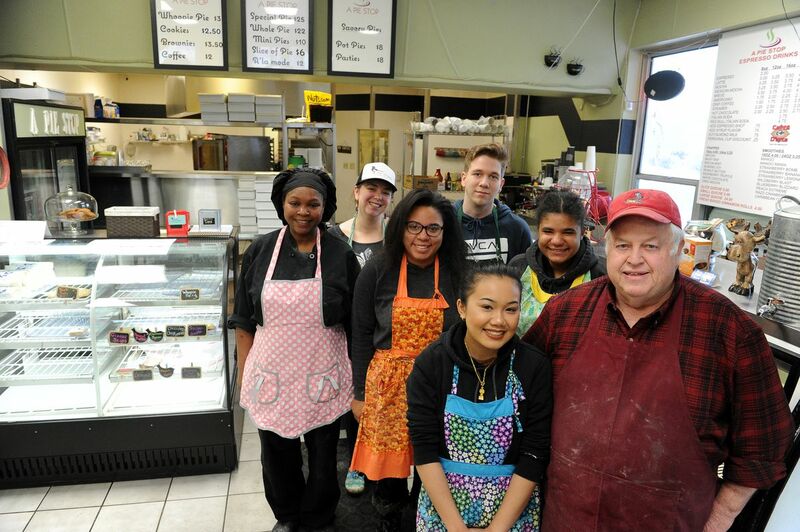 When 18-year-old Alisa Louangaphay took ownership of the Midtown Anchorage bakery A Pie Stop in March, she wanted to surround herself with people who were as passionate about baking as she was. So she hired three other teenagers. "It does sound a bit scary. (But) we aren't a bunch of delinquents. We all do extracurriculars. We all work hard in school. We all do our best. We try really hard to make sure every customer that leaves here is satisfied," Louangaphay said. Newly graduated Lily Rodriguez, 18, and her 16-year-old sister Carolyna are bakers in the shop. Christian Bowers, an 18-year-old senior at Polaris K-12 School, is the bakery's barista. Louangaphay assists in the baking and, with the help of her grandfather, handles all the business aspects of running A Pie Stop, all while she finishes up her senior year at SAVE High School. Together, the crew turns out 27 different kinds of pies, plus fruit turnovers, cookies, cinnamon rolls, cheesecakes, brownies, quiches and espresso. Cornish pasties – a hard-to-find meat hand pie – are a popular item, typically selling out around 2 p.m. daily. Gluten-free pies are also available by special order. Louangaphay may still be a teenager, but she's been baking for most of her life. She was first introduced to it by her grandfather, Steve Satterlee. When she was very young, she would help him bake at the Chokecherry Inn, a bed-and-breakfast their family owned in Fairbanks. "She started baking pies with me when she was just 4 years old. She always wanted to help me. That's all she's ever wanted to be, is a baker," Satterlee said. Louangaphay studied at the King Career Center culinary arts program in 2016. She attended the University of Alaska Anchorage Bakery Boot Camp for several summers in a row and the University of Alaska Fairbanks Business Week, where high-school students learn about entrepreneurship. Last spring, she spent a semester at A Pie Stop under its previous owners as part of a culinary internship. She had been working there about four months when her grandfather proposed purchasing the bakery for her. "I was eating (at A Pie Stop) when I overheard a conversation that the shop was for sale. I made the decision to cash out some of my retirement money to make Alisa's dream come true," Satterlee said. Satterlee bought the bakery in March. Both Satterlee and Louangaphay worked for two months with previous owners Dawn Kauffman and Fanny Miller, Amish and Mennonite bakers who taught Louangaphay and Satterlee their recipes. Many of those recipes are still on the menu, including whoopie pies, a traditional Amish dessert. Amish butter shipped from Ohio is also available for purchase at the bakery. "I've always had that dream. I've always been set on this path … I wanted to prepare myself for when I got older, for when I actually got to run my dream. I didn't think it'd happen so soon," Louangaphay said. It was through the King Career Center culinary program that Louangaphay met with Bowers and Lily Rodriguez. "It's fun working here. It's a bunch of kids here, so we're just baking and having fun," said Rodriguez, who completed a year at the King Career Center culinary program and graduated from Service High School in 2017. Rodriguez has been the shop's head baker since August and recruited her younger sister Carolyna, a home-schooled student, to work at A Pie Stop with her in October. "People are usually surprised to see me working here, like, 'Wow, I've never seen a 16-year-old work at a bakery.' And yeah, because that really doesn't happen that much because people don't want to give them a chance. I got lucky," Carolyna Rodriguez said. Carolyna Rodriguez, Louangaphay and Bowers are all receiving school credit for their work in the bakery. Starting as a new business, Satterlee says they've had some stumbles. Whether it's locking down the perfect recipe for pie crust, removing or adding items to the menu or figuring out how to be efficient during the holiday rush, running the bakery how Louangaphay envisions it has been a learning experience. "After the previous owners left, business went down. Anytime a business changes ownership, you lose some of those old, loyal customers. We have had to build a new customer base," said Satterlee, who's in charge of the bakery's finances. Before Satterlee retired three years ago, he worked as a purchasing agent for Alyeska Pipeline. But since then, Satterlee says, they've been able to grow their customer base with strategies like radio advertising and contests for free pies. A recent partnership with The Magpie has also increased business. Since November, The Magpie, which operates a food truck in the summer, has rented kitchen space in A Pie Stop. Customers can now order breakfast and lunch from The Magpie at the same counter where they get pies and pastries. Plus, Magpie owner, Amanda Cash, is an on-site mentor to the young bakers. In addition to running The Magpie, Cash spent two years as a chef in Denali and served as the executive chef of a restaurant in her home state of Indiana. She also spent several years as a cooking instructor. Cash has some creative ideas for 2018, including a pie-of-the-month club, creating an area for live music and having pies available to take and bake at home. As for Louangaphay, once she graduates from high school, she plans to increase her hours and dedicate more of her time to growing her young business.